Have you ever had the perfect photo ruined by someone with their eyes closed in the shot? 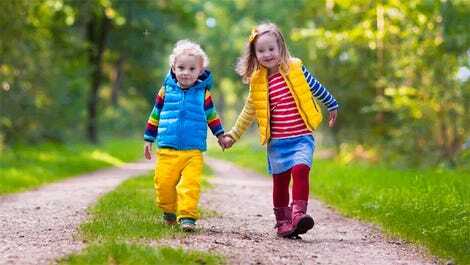 You could fix the problem with a bit of cloning from an alternate shot using a photo editing app—but Adobe is making the process much easier in the new 2018 version of Photoshop Elements with a dedicated ‘Open Closed Eyes’ feature. 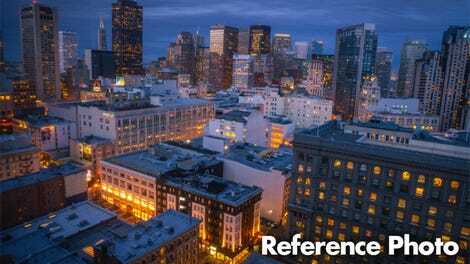 You can spend an entire career using Photoshop and still not master the software’s every last feature, but that complexity can be intimidating to the millions of amateur photographers born from the advent of affordable digital-SLRs, and even smartphones. That’s where Photoshop Elements comes in. 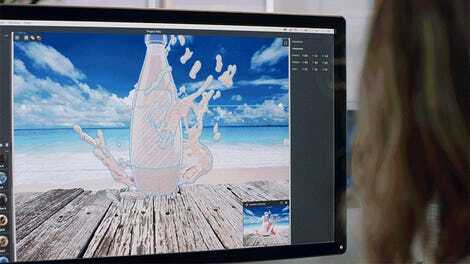 It’s a lighter version of Photoshop with training wheels that simplifies many popular photo editing techniques. A better way to describe it might be as a version of Photoshop your parents could stumble their way through with minimal phone calls to you. Experienced pixel pushers will almost certainly continue to balk at Elements’ limited feature set and hand-holding. New features like turning a photo into a watercolor painting, automatically creating ghost-like double exposures, or adding shape overlays to your shots seem tailored to the scrapbooking crowd. 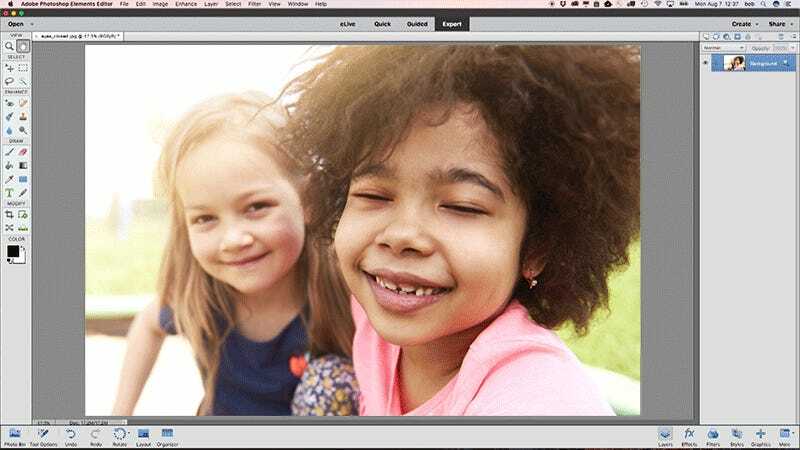 But thanks in part to Adobe Sensei, the company’s artificial intelligence and machine learning framework, Photoshop Elements’ automated features are becoming appealing to more than just dabblers. The Magic Wand’s selection tool’s days are numbered. 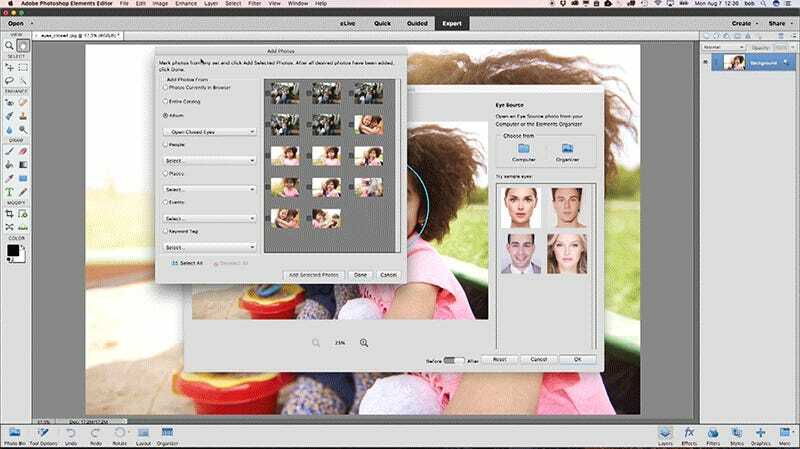 If you’re a little too trigger happy with your camera’s shutter button, Photoshop Elements 2018 makes it easier to wrangle thousands of photos by intelligently curating the best shots based on visible faces, and the perceived technical quality of the shot. It also makes swapping out the background of a photo an easier, one-click affair, and improves the challenge of making complex selections by letting you simply drag a box around the object or person you want isolated. The edge detection and refinement of the mask is all handled by an AI-powered algorithm that’s invisible to users. But Photoshop Elements 2018's most compelling new trick makes it easier to rescue a photo ruined by a blink. Calling it ‘Open Closed Eyes’ might be over-selling the feature a bit, as it doesn’t magically reveal what’s under a subject’s closed eyelids. Instead, users specify which face in an image has closed eyes, and then select a handful of alternate shots from Elements’ photo library where the person has their eyes open. The software will then automatically select a set of eyes that best matches the closed ones (based on lighting, time of day, etc. ), and automatically swap them into the shot. In the past, features like this from Adobe were always hit and miss, and seemingly only worked best during product demos using sample shots that were tailored to an algorithm’s strengths. But now that these features are powered by a machine learning framework, they can be—in theory—perpetually improved every time a software update is released. Over time they’ll continue to learn how to handle a more diverse variety of photos as they process more and more samples. So while Photoshop Elements might not have the robust manual toolset that Photoshop does, it might be time to stop looking down on the cheaper, $100 alternative to Adobe’s flagship product. If a bit of artificial intelligence can streamline your workflow with pretty impressive results, there’s nothing wrong with taking the easy route.